The private pilot reported that he was approaching the airport for landing in the multi-engine airplane when both engines began to surge. The pilot attempted to switch to the auxiliary fuel tanks, but inadvertently switched the left engine fuel selector to the off position. The left engine subsequently experienced a total loss of engine power. On final approach for landing, the airplane impacted terrain and was subsequently consumed by a postimpact fire; the fuel onboard the airplane at the time of the accident could not be determined. An examination of the airplane's engines and systems revealed no mechanical anomalies that would have precluded normal operation. The pilot's improper management of fuel to the left engine during approach for landing, which resulted in a total loss of left engine power due to fuel starvation, and his subsequent failure to maintain control during the final landing approach, which resulted in collision with terrain. On August 9, 2015, at 0925 mountain daylight time, a Cessna 421B, N726JB, impacted terrain following a loss of left engine power during final approach for landing on runway 12 at Clovis Municipal Airport (CVN), Clovis, New Mexico. The pilot received serious injuries and the airplane sustained substantial damage. The airplane was registered to and operated by the pilot under 14 Code of Federal Regulations Part 91 personal flight that was not operating on a flight plan. Visual meteorological conditions prevailed at the time of accident. The flight originated from a private airstrip near Melrose, New Mexico, and was destined to CVN. A completed National Transportation Safety Board (NTSB) Pilot/Operator Aircraft Accident/Incident Report Form 6120.1 was not received from the pilot, as required by Part 830.5, by either the NTSB Investigator-In-Charge or Federal Aviation Administration (FAA) Coordinator for the accident. Witness stated that they heard the airplane engines "popping" as it approached and entered the traffic pattern. The airplane left wing contacted terrain short of runway 12 and the airplane cartwheeled. A post-impact fire occurred and the wings and fuselage were severely damaged. The pilot provided a limited statement to the FAA Coordinator, in which he stated he had ample fuel for the short flight from a private ranch in Melrose, New Mexico to CVN (30 miles to the east), when both engines began to surge. The pilot stated he attempted to switch both tanks to Auxiliary but inadvertently switched the left fuel selector to Off. The left engine experienced a total loss of engine power. The pilot said he was too high to land on runway 22 and attempted to land on runway 12. However, the airplane impacted terrain approximately 1,000 feet southeast of the runway 12/22 intersection between runway 12 and the parallel taxiway. The aircraft was traveling southeast attempting to land on runway 12 before losing control. An examination of the wreckage was conducted by an FAA inspector and the total amount of fuel onboard the airplane at the time of the accident could not be determined due to post impact damage and fire. No anomalies were noted with the airframe or engines that would have precluded normal operation. 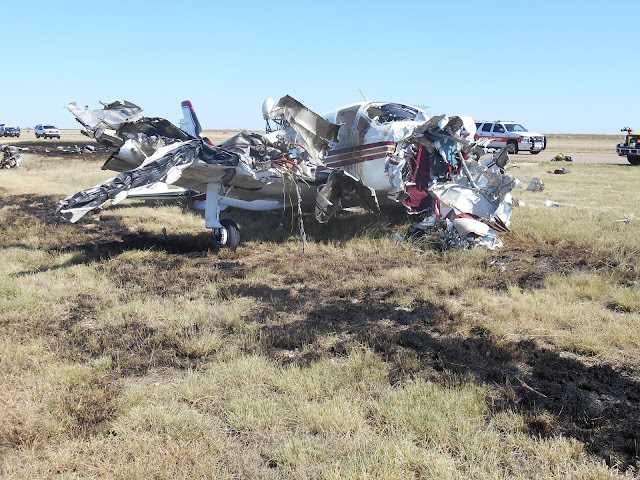 On August 9, 2015, at 0925 mountain daylight time, a Cessna 421B, N726JB, impacted terrain following a loss of left engine power during final approach for landing at Clovis Municipal Airport (CVN), Clovis, New Mexico. The airplane sustained substantial damage. The pilot received serious injuries. The airplane was registered to and operated by the pilot under 14 Code of Federal Regulations Part 91 personal flight that was not operating on a flight plan. Visual meteorological conditions prevailed at the time of accident. The flight originated from a private airstrip near Melrose, New Mexico, and was destined to CVN.